Feeling uneasy and full of anxiety Melanie starts this seemingly harmless trip. The cruise liner ‚Borysthenes‘ is going down the Dnieper river from Kiev, heading for the Black Sea and on to Sevastopol in the Crimea. Foreseeable 14 days: church viewing, museum visits,city tours. What she fears is confronting the past – which nevertheless is her motive for being here. The reason for this journey is a research assignment, but she isn’t succeeding in keeping the scientific question free of her own emotions. What she wants to know from her fellow travellers is superimposed by what she knows herself. 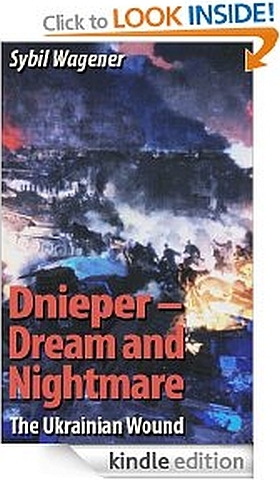 What for her was almost unbearable to read in the documents must become here, on the scene, thecrucial test … She experiences the trip in two ways: On the one hand as aDnieper Cover Ebookn introduction to a country about which she had little knowledge and whose changeable history fascinates her. Didn’t Catherine the Great embark with her flotilla from Kiev to the ‚Tauride Journey‘ in the Spring of1787? Didn’t Potemkin hide the wretched villageson the banks of theDnieper behind beautiful facades? Didn’t theEmpress inaugurate the Black Sea fleet in Sevastopol and present herself in thegarden palace of the Khans of Bachcisaraj as the triumphant winner – and are these not places scheduled on the programme of their cruise? Melanie learns a lot about the history of this borderland that was the cradle of Orthodox Christianity, before the Golden Horde in 1240 wiped out all life on the Dnieper. On the other hand this voyage leads her directly into the heart of darkness… One issue seems to be tabooed: the German invasion of the Soviet Union in June 1941. The Wehrmacht hasn’t only fought battles. It has cleared the way for the Holocaust, which began here, long before Auschwitz. Immediately behind the front, using the field grey of the army as camouflage, the SS-Einsatzgruppen performed their bloody business of exterminating Eastern European Jews. They rounded up civilians: women, children, old people (the younger men tried to flee to the Soviet army or into the forests) and killed hundreds of thousands „by hand“. The poison gas was „tested“ at Soviet prisoners of concentration camps, before the gas chambers were built. Melanie doesn’t trust her fellow travellers. She doesn’t believe that they came only for the country’s monasteries and Cossacks. German tourists have been booking these cruises since the 1970s – a very specific group of people: former combatants. Few of them are now still alive; among the passengers Melanie can spot only a tiny handful of veterans. The majority belong to the post-war generation which had provided the recruits for the 68-protests. Melanie suspects that each of the travellers has a hidden motive for their journey rooted in family history. Her mission is to find out how a ‚black legend‘ is generated: The transformation of a genocidal bloodbath into a myth, which gets integrated into the history of civilisation, being an integral part of it instead of being denied. What she detects is, of course, not theoretical. History consists of tales. The book combines a travelogue with historical passages that reflect the state of scientific research at the time of writing the manuscript. The plot and the characters are fictitious. Any resemblance to real persons is purely coincidental.